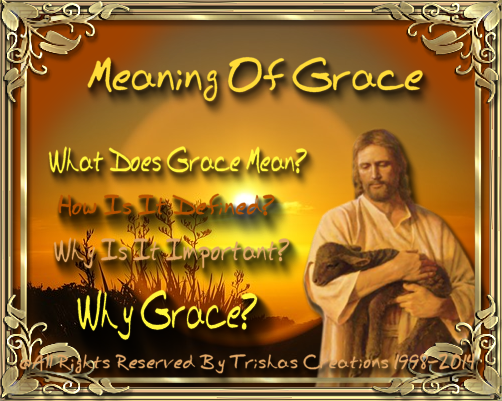 Welcome to "Meaning Of Grace"
I am sure there were times, where you would take a special word that means allot to you and create special words with those certain letters ! I got this while back from "Morningview Baptist Church" here in montgomery,al and thought this would be cool to share with you. Ask yourself this question, If you were standing before God right now and He asked you, "why should I let you into Heaven, " what would you say to Him? God's Glory : God created us in His image for His own Glory, and He is the Ruler of all our good. God has given us law to govern us in to more fully reveal His glory , truth, and His Love in Us We honor Him by honoring, obeying His law and treasuring Him above all else. Rebellion : The Bible calls Rebellion a sin. We are ALL Sinners by nature and by choice. Sin we all fall short of God's Glory and His perfect standards of holiness and instead of Loving Him and obeying Him, honoring Him, we have rebelled against Him. God's rules and disobeyed His laws. "Have you kept all of God's Commandments?" Our sin and our rebellion separates us from God, and in accordance with His justice we become objects of His judgment and His wrath. Our sins leads us to death and suffering in a literal place called Hell, where sinners are eternally separated from God's Glory. Atonement : We cannot save ourselves, that's impossible. We cannot save ourselves from death or God's Wrath. For God's Own Glory, God sent His Son Jesus to make an atonement for Our Sins. Jesus Christ who died on the cross in the sinner's place, US, so then we are reconciled to a rightful Relationship with God. Because of His Obedience and sinless life, Jesus attained righteousness on the sinner's behalf. Through Jesus' sacrificial death on the cross, Jesus has Paid our penalty for our sins. His resurrection, Jesus defeated death and provided eternal life for all who believes in Him. Conversion : In Steps: First, we must Admit we are Sinners, and we cannot save ourselves and that Jesus Christ alone is the only way to have our sins forgiven and be reconciled back to God. Second: We must REPENT. Repentance is turning away from your old self and the love of your self, and sin and turning towards GOD and His graciousness His Love which has been displayed through Jesus Christ. Thirdly: We Must BELIEVE with our whole heart in Jesus Christ ,we must surrender completely to His Lordship over us. Eternal Life : Believing that you have been Born Again you now have Eternal Life in Christ Jesus. The Bible and the promises of God which is in the Bible will now become personal to you and your heart. You will now sense that God is speaking to you and through His word and you will have a spiritual hunger for Him and His word. You will have an inner sense and peace of forgiveness and a special purpose as His Child. The presence of the Holy Spirit is in you and will give you the sense of coming back Home to God. You will Glorify God through your changed actions, your words and even your attitudes. You will have a sense of revulsion towards sin and refuse to sin in your life. Your Love will become sincere and for other people and Christians and you will be able to share Christ with other's who do not know Him, continue to read His word and spread it abroad.